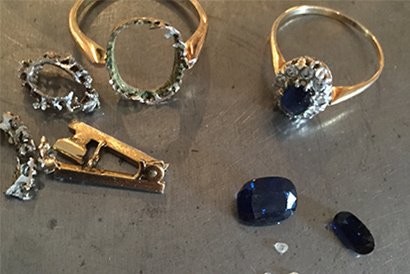 Sara had inherited jewellery with blue sapphires and it was important for Sara to make a jewellery where the blue sapphire was visible. To make a piece of jewellery she could wear every day. 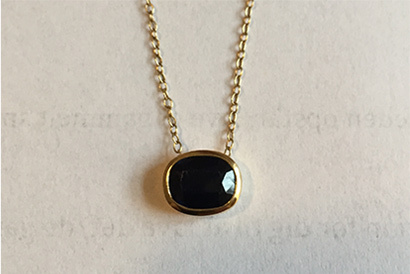 We ended up making a necklace in yellow gold with one of the sapphires. Sara would like to think about what she like with the other Sappires. Deciding what to do with my great aunts jewellery has been a long and emotional process for me. Pernille has been my guide, not only the designer and I couldn’t be happier with the result. Now I can wear my beautiful sapphire every day. I really liked Pernilles style and wanted to find a way to incorporate it in my jewels collection. 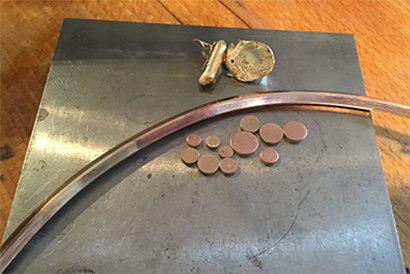 It has been great to get a beautiful piece, but I am almost more grateful for the insights that makes me want to try new things with my jewellery. Pernille has designed a beautiful necklace that fits me and the way I want to use it. Well done! Birgitte had inherited around 35 grams of old gold from her grandmother. She wanted very much to make jewellery out of her gold, so she could have her grandmother with her every time she wears the jewellery. We ended up making 5 rings of her own gold that fits together but also can be worn individually. She can also set the rings together differently every time she wears them. We also made a matching pair of earrings and two bracelets. Pernille helped transform my Grandmothers everyday favorite but also contemporary gold neclaces and bracelet into an exclusive, elegant and time-less tribute to my Grandmother. A tribute matching my wishes for personalized and fashionable jewelry – I often find myself admiring it’s beauty when I’m wearing it, watching how the light is reflected in the angled surfaces, and enjoying the entity of the mixture of rings. I get images of Magic glowing waterlilies and moons – as a miniature Monet on my fingers. Through-out the transformation process, Pernille guided me honestly in the possibilities, and what limits was inherated in the old gold. In particular, I enjoyed sitting with her, and playing with how to place and angle the discs on the rings and the bracelets and arrange the ear-rings. It was a great way to combine my own ideas with her expertice and creativity. 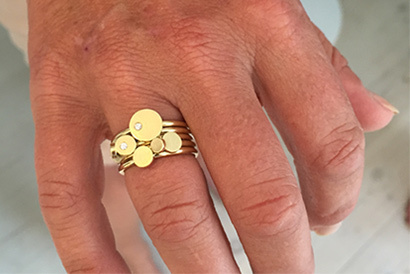 My Grandmothers favorite pieces have been transformed from something hidden in a drawer, to my very favorite every day and special occasion jewelry – just as it was then for my Grandmother.